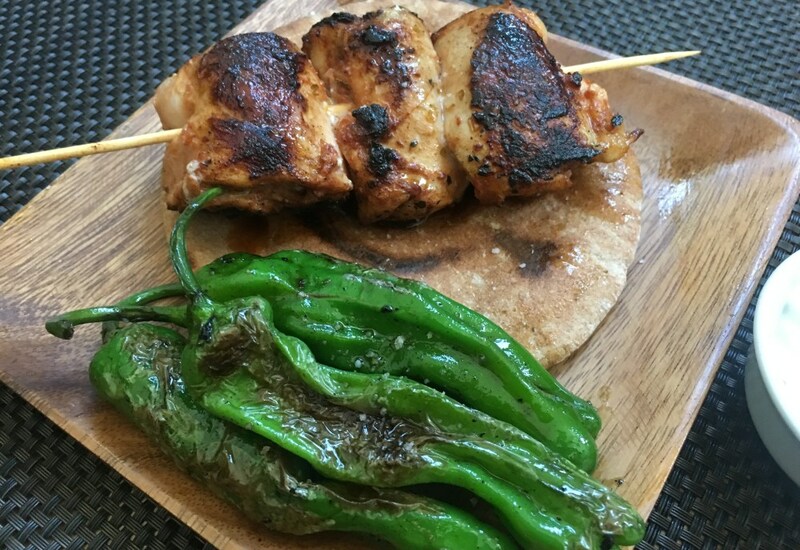 Easy, healthy and nutritious, grilled chicken kebabs with shishito peppers are a great option for a protein-packed dinner. The chicken is quickly marinated in a blend of spices then cooked over high heat to get a smoky char. Sweet shishito peppers cook in just a few minutes, and don't need more than a little lemon juice and salt for maximum flavor. If you prefer, you can also grill the chicken over high heat—just be sure to soak your skewers for an hour before threading the meat onto them. Serve the kebabs with refreshing yogurt-cucumber tzatziki and toasted pita bread for a Greek-inspired meal. Cutting the chicken into smaller pieces lets you skewer them easily and cook more evenly. If your pan isn’t big enough to fit the skewers, cook them under the broiler set on high, about six inches from the heat source. Serve the skewers and peppers with hummus for a different flavor combination. Per Serving: 667 calories; 30g fat; 41.0g carbohydrates; 62g protein; 277mg cholesterol; 817mg sodium. This chicken kebab is very flavorful and tastes just like what I would order at my favorite Lebanese restaurant. We served the chicken and peppers over rice. Very good, quick dinner. Loved the chicken in this dish, it was incredible. We used thighs and they were really tender. The shishito peppers were a nice complement too.